As we age, one of the things that happens is the inevitable losses of family and friends. Death. Divorce. Estrangement. People moving away. All these events create not only emotional stress, they can affect our hearts, both physically and energetically. I remember when my professor from Brown University passed away. I knew as soon as he was diagnosed with pneumonia that I was soon to lose him. I urged him to go to the doctor right away. He was diagnosed with lung cancer, and stopped smoking the same day he received the news. The thought that I might lose one of the most important people in my whole life weighed heavy on my mind, and I even offered to travel up to Providence to help take care of him. He declined. I think he knew that he was spending his last months on earth and was making his own peace with the process. The last time I spoke to him was two days before my birthday. He was getting ready to have an operation. I clung to his every word. We had spoken every week for 27 years. His mentorship provided the stability I needed to grow into the person I am today. What he taught me all those years was priceless to me in every way. And most of all, there was his constant, unconditional love. Because of Professor Kermit Champa, I know how to be a great mentor to other people. I learned by his example. He was the father I always wanted but never had. Although we may never be able to replace the people we have lost in our lives, we can grow beyond these losses and overcome loneliness by creating spiritual family. Many of us grew up with something missing in our biological families. Either an actual person was missing, such as a mother or father, or brother or sister, or the intangible qualities of unconditional love and support were missing. As we become adults, we have the wisdom to choose people in our lives to connect to in a deep, meaningful way. These individuals can be the father we always wanted but never had. Or the mother, aunt, uncle, sister, brother, daughter or son. At the moment, I am blessed with many sisters. I never actually had a sister growing up, but now I have many. They are wise women who have earned their stripes off the back of learning how to be a loving person even in a world that is not always easy. In January, I gave away probably one third of my jewelry to these lovely ladies. My hobby is making jewelry, so I knew I could always replace what I gave away with new bracelets, necklaces and earrings that I would make myself. I wanted to clear away old energy out of my life, and I wanted to pass along my beloved, personal objects to women I felt most close to. I gave away silver and gold, rubies, diamonds, blue topaz, malachite, opals, sapphires and precious gems of all kinds. Some of these were items I had made myself. Others were objects I had spent even thousands of dollars to purchase and worn on my person for many years. It meant a lot to me to share these with my spiritual sisters. Sometimes a person is born into another part of our biological family who we have an immediate spiritual connection with. Our whole family was so blessed when my niece Sarah Jane was born to my brother Richard and his wife Donna. Now that she is six years old, we bead together, paint together, draw together, play with clay together, decorate gingerbread houses together and play with my dog Belle together. Like me, Sarah Jane is very shy. But she opens up when she is around me and we talk constantly about many different subjects. When I go down to Savannah to visit, she will be waiting eagerly for me at my brother’s house as she knows I will come bearing some special present I made just for her. Choosing our own spiritual family can create connections even deeper and more meaningful and more rewarding than the ones we come by naturally through the accidents of birth. 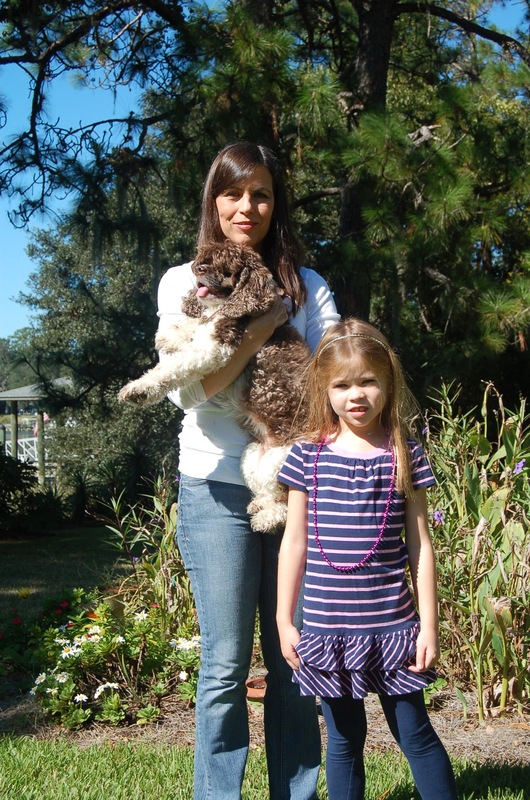 Photo: Me with my dog Belle and my niece Sarah Jane.